The Baptistery is the large, polygonal building in front of Florence Cathedral. Like the cathedral, it has a magnificent marble façade. Famous are among other things the gold pictures in the doors and paintings inside the baptistery. Here you find all info for visitors. A Baptistery (Baptistery of Baptism) was necessary in the past, since people who had not (yet) been baptized, including children, were not allowed to enter the cathedral. So the babies had to be baptized in another building first. The Baptistery of San Giovanni is the large building directly in front of the cathedral. Like the cathedral, it has a large dome (26 metres in diameter). Very famous is the picture (ceiling painting) on the inside of the dome, probably by Coppo di Marcovaldo from the 13th century. 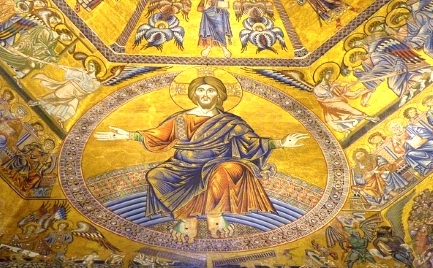 It shows Jesus Christ as judge with one hand up his thumb and the other hand down his thumb. On the side with the thumb up are the lucky elect. On the other side (thumb down) you can see scenes from hell. Even more famous are the 10 golden pictures on one of the three doors to the Baptistery of Florence Cathedral. 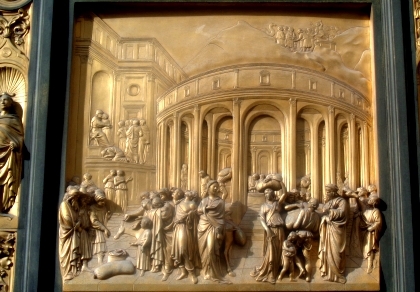 The pictures date from the early 15th century and are by Lorenzo Ghiberti. A special technique gives the pictures a depth, today one would say a 3D effect. Some scientists think that the gold images on the baptistery were the first 3D images in the world. Today this kind of art is called bas-relief technique. The 10 works of art include scenes from the Bible. 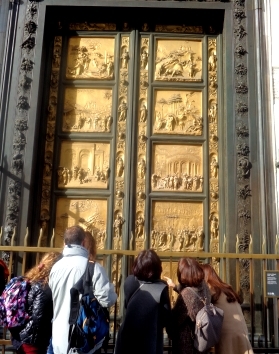 The so-called paradise door is by the way only a very good copy, the original is in the great museum of the cathedral about 100 meters away. Admission is unfortunately only possible with a ticket for about 18 euros, which is also valid for other sights in and around the cathedral (ascent of the dome, Campanile bell tower, Florence Cathedral Museum, etc.). The Baptistery of San Giovanni Firenze, like most churches in Italy, can only be entered with appropriate clothing, no short trousers and shoulders covered. Dogs and large bags are not allowed. One should talk as quietly as possible. The opening hours are not always the same and are published on monitors at the cash desk for the next few days. During our visit in 2018, the Baptistery at the Cathedral was open to visitors Monday through Friday from 8:15 a.m. to 7:30 p.m. However, it was closed for one hour on all days from 10:15 to 11:15. The opening hours on Sunday are shorter, at our last check on site from 8:30 to 13:30 without a break (beginning of 2018). The film is about 3 minutes long. You can walk around the baptistery on the cathedral square. During the Renaissance it was mistakenly thought that the Baptistery was much older, from the time of Roman antiquity. In fact, the baptistery was probably built in the early Middle Ages, but we do not know exactly. The first documents mentioning the Baptistery date from the 11th century. The full name is Baptisterium San Giovanni. San Giovani is in German John the Baptist. The full Italian name of the small church next to the cathedral is: „Battistero di San Giovanni Firenze. 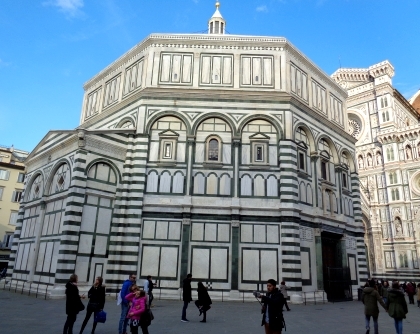 In tourism the baptistery of Firenze is often called „Florence Baptistery“. The word baptistery comes from the word baptize (Italian: battezzare or English to baptize). Just like the cathedral, the marble facade is great. The interplay of the colours of the marble (white and green, church also pink) fascinates almost every visitor to Florence.